The texts quoted in Level 3 are directly sourced from the opinion "Health effects of security scanners for passenger screening (based on X-ray technology)", produced in 2012 by the SCENIHR (Scientific Committee on Emerging and Newly Identified Health Risks) of the European Commission. The possibility of introducing security scanners on the list of eligible screening methods and technologies for screening persons was first proposed to the Council and the European Parliament on 5 September 2008 on the basis of the positive vote of the Member States' aviation security experts. On 23 October 2008, the European Parliament adopted a resolution on the impact of aviation security measures and security scanners on human rights, privacy, personal dignity and data protection, requesting a more in-depth assessment of the situation, opposing the Commission's proposal. The Commission agreed to review these matters further and withdrew security scanners from its original legislative proposal. The draft legislation became Commission Regulation (EC) No 272/20093 to apply as of 29 April 2010. The Commission consulted with all parties concerned and issued a first analysis on the use of security scanners: the Communication to the European Parliament and the Council on the use of security scanners at EU airports of 15 June 2010. Following this Communication an in-depth impact assessment was carried out by the Commission. It concluded that security scanners are an effective method for the screening of passengers and should be authorised for use at EU airports under certain operational conditions and detection performance standards. The report also identified the need to avoid any risks to human health and to ensure the protection of fundamental rights. Consequently, the Commission proposed to add security scanners to the list of the method for the screening of passengers and linked their use to a number of conditions. On 10 and 11 November 2011 the Commission adopted this legislation. The relevant elements of the package are contained in Regulations 1141/2011 and 1147/2011. In particular, under the new legislation security scanners are not mandatory for Member States and/or airports and can only be used at EU airports in accordance with minimum conditions such as for example that: security scanners shall not store, retain, copy, print or retrieve images; any unauthorised access and use of the image is prohibited and shall be prevented; the human reviewer analysing the image shall be in a separate location and the image shall not be linked to the screened person and others. 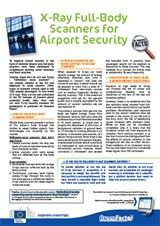 Passengers must be informed about conditions under which the security scanner control takes place. In addition, passengers are given the right to opt out from a control with scanners and be subject to an alternative method of screening. In order to safeguard citizens' health and safety, at this stage, the Commission has allowed Member States and/or airports to deploy only security scanners which do not use ionising radiation. Commission Regulation (EU) No 185/2010 of 4 March 2010 lays down detailed measures for the implementation of the common basic standards on aviation security. Point 4.1.1.2 of the Annex determines that passengers can be screened by a hand search or by a walk- through metal detector. Additional requirements on combining different methods in order to achieve effective detection are included in EU security restricted legislation. In the EU, some countries tested security scanners and have now introduced security scanners under the new rules. In the current international context, security scanners are being deployed at airports worldwide, especially in the USA which deploys currently several hundred security scanners. Russia has been using security scanners at airports since 2008 and will continue to deploy them more widely in the future. Other countries are either planning (e.g. Canada, Australia) or examining the possibility of introducing security scanners (e.g. Japan). While X-ray based security scanners are currently used in the USA and as a trial in one UK airport, several Member States (e.g. Italy, France, Germany and Austria) prohibit the use of ionising radiation for non-medical purposes. As indicated in the recently adopted legislation on security scanners, the Commission would like to receive information on the impact on human health of the technologies available on the market and in particular on the X-ray based security scanner technologies. The final opinion on "Health effects of security scanners for passenger screening (based on X-ray technology)", was adopted by the SCCS on 22 March 2011. To assess the potential health effects related to the use of all types of security scanners used for passenger screening which emit ionising radiation. If any effects are identified under 1, to quantify the risks and, if feasible, to estimate the additional number of cases of diseases that are expected to occur in Europe due to the use of this technology at EU airports, differentiating between the general public and exposed workers as indicated below. In its assessment, the SCENIHR was asked to consider in particular the risk for populations that are regularly exposed to such technologies (e.g. frequent flyers (to be defined), air crew, security workers operating the scanners and other airport staff) and potentially vulnerable groups (e.g. pregnant women, children). As health protection against ionising radiation falls under the provisions of the Euratom Treaty, the SCENIHR was asked to consult in its assessment the Group of Scientific Experts referred to in Article 31 of the Euratom Treaty (Art. 31 GoE), advising the Commission on radiation protection matters.